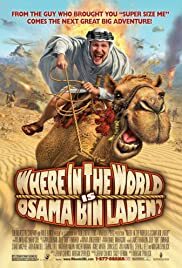 DVD Review: Where in the World is Osama Bin Laden? In honor of Homer Simpson's journey to the MLB Hall of Fame, this mockumentary interviews players, sportscasters, historians, and Springfieldians to recall the greatest corporate softball game ever played as told in "Homer at the Bat." A collection of documentaries that explores the hidden side of human nature through the use of the science of economics. Madrass Student: I have no opinion. The movie tells the very actual life (even its not 100% but close enough to than any U.S public media from the past 10 years)of the people who live in the regions where we were told evils came from and the image of U.S and terrorists in their eyes. The docu itself is moderate on its opinions about U.S foreign policy in the regions as well as the anti-terrorist campaign. You don't expect it tells you what is good or what is bad, but the differences as well as similarities that wildly exist in these cultures. The movie seems to be one of those kind that try to wake up the ignorants or to introduce the concept of co-existence with differences. Unfortunately, those who would take time to watch the movie or those are able to understand it are not what the movie intended to. Many of them already known the message and the film doesn't go any further than that. And those whom the movie intended for are very likely not able to understand it and feel offended.